The Savill Garden, Windsor Great Park. Lysichiton camtschatcensis, The Western Skunk Cabbage. Last weekend the sun came out. For those of you who are not British, sunny weather, even when it’s still cold, means the UK population suddenly feels compelled to wear as little clothing as possible and bare acres of pasty white flesh. It’s not a pretty sight. Happily another side effect of these sunny spells in spring is that everything decides to flower at once. And that makes for a very pretty sight indeed. 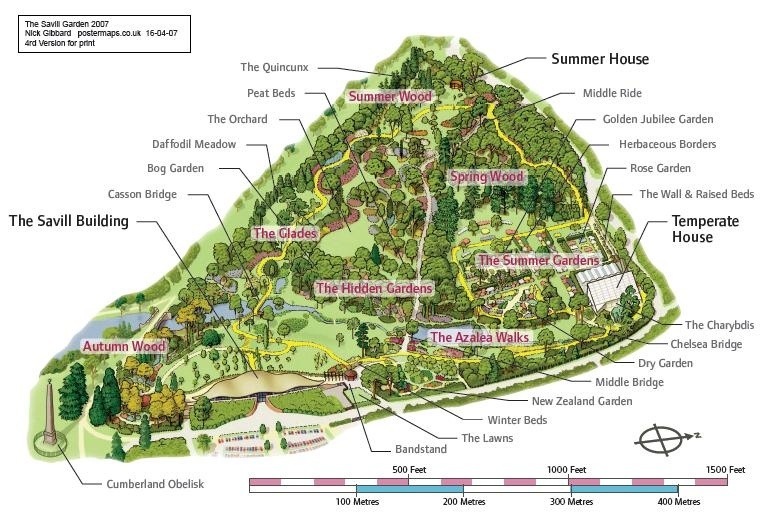 Quite how it’s taken so long for me to get around to visiting The Savill Garden, on the edge of Windsor Great Park, I don’t know. I lived less than 25 miles away for 15 years whilst studying and living in Reading, but never made it here. Fortunately, the great thing about great gardens is that they stay put and get better with age. The stream, edged with Lysichiton, from Middle Bridge. Until the middle of the 20th century, Windsor Great Park was essentially without any great public gardens. Then came Sir Eric Savill in 1931, who gained endorsement from George V to create a woodland garden in an area of oak forest on the fringes of the royal park. The ground was sandy and gave rise rise to numerous natural springs. 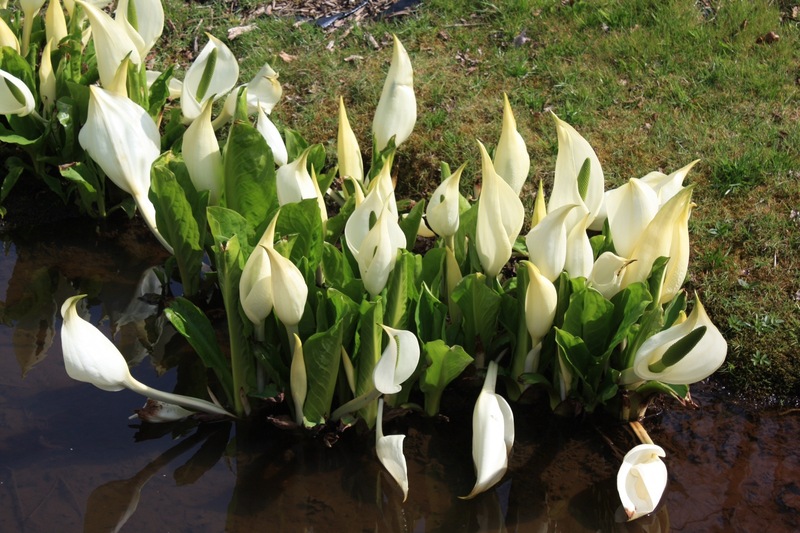 Today these fill two ponds connected by a meandering stream. The ground was cleared of brambles, birches and aggressive Rhododendron ponticum, so that by 1939 the garden had more or less taken shape. 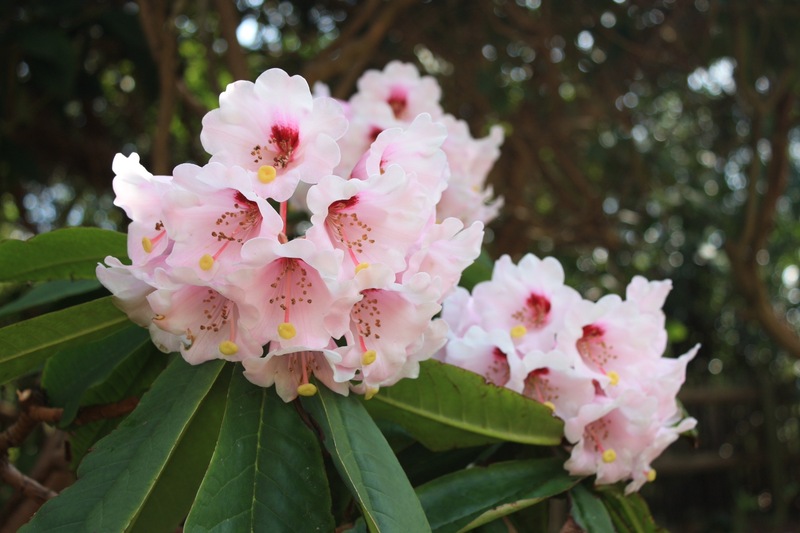 Nowadays, fancier Rhododendron hybrids make their home here, including Rhododendron ‘Wayford’ and ‘Jocelyn’, below. Originally referred to as the Bog Garden, in 1951 George VI decreed that it should become known as The Savill Garden. Knighted in 1955, Sir Eric directed the gardens until 1970, passing away in 1980. Sir Eric’s guiding principles of intelligent design, quality plants and excellent maintenance are still very much in evidence today and it was impossible to pick fault with the quality of the gardening. Though it offers something to see throughout the year, The Savill Garden is best known for its spring display. The cast of flowers starring here last weekend was endless. 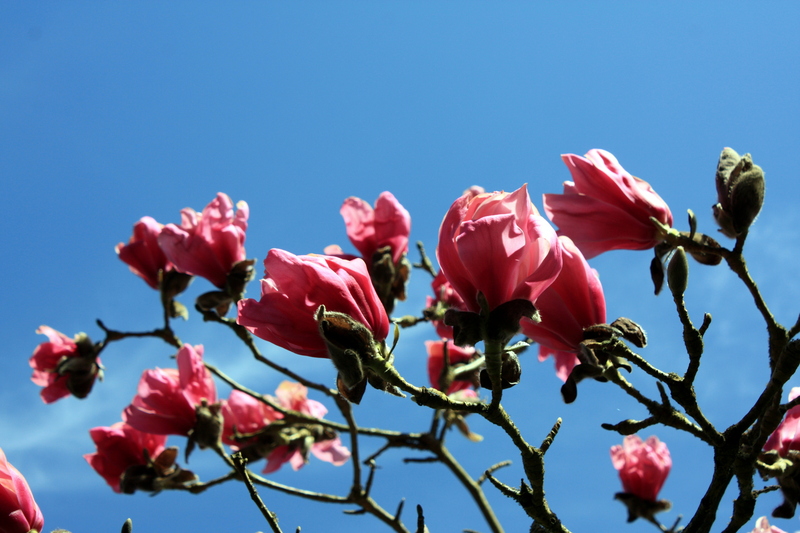 The leading ladies were the magnolias, resplendent in subtle and not so subtle shades of pink. 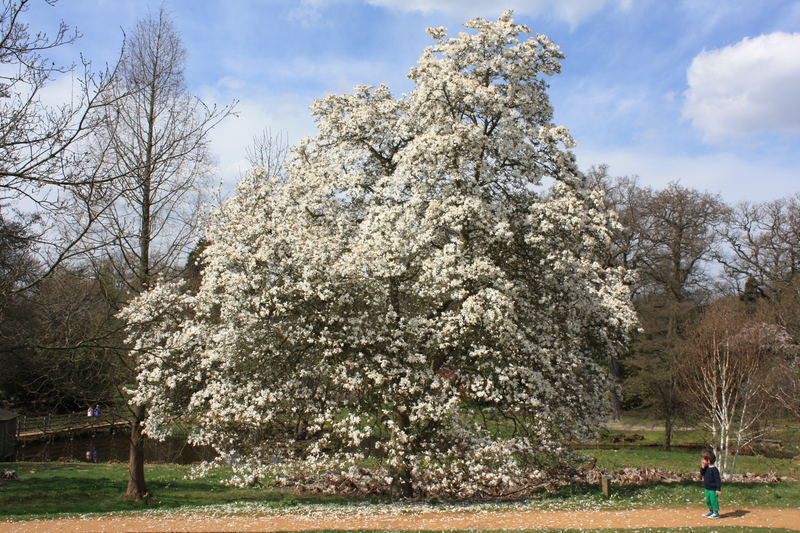 On leaving the Savill building (top of post), visitors are welcomed to the show by a mature Magnolia loebneri ‘Merrill’, smothered with ice-white flowers and attracting considerable attention. Magnolia loebneri ‘Merrill’ in front of The Savill Building. Away from the limelight, in a far corner of the garden near the summer house, is the visionary Knight’s namesake, Magnolia sprengeri var. sprengeri ‘Eric Savill’, with large, boldly pink flowers emerging from buds the size of shrews. I wonder if Sir Eric lived to see this tree flower and if so what he thought of it. Magnolia sprengeri var. sprengeri ‘Eric Savill’. The show’s unconventional leading men have to be Lysichiton americanus and Lysichiton camtschatcensis (above), both skunk cabbages, but the former hailing from North Amercia and the latter from Asia. Unusually for anything Amercian, the yellow L. americanus is slightly smaller, but both species appear to spread prolifically when happy. A new hybrid has arisen in the garden which has creamy coloured spathes. After flowering, enormous, paddle like leaves are produced, but by then the performance is over. 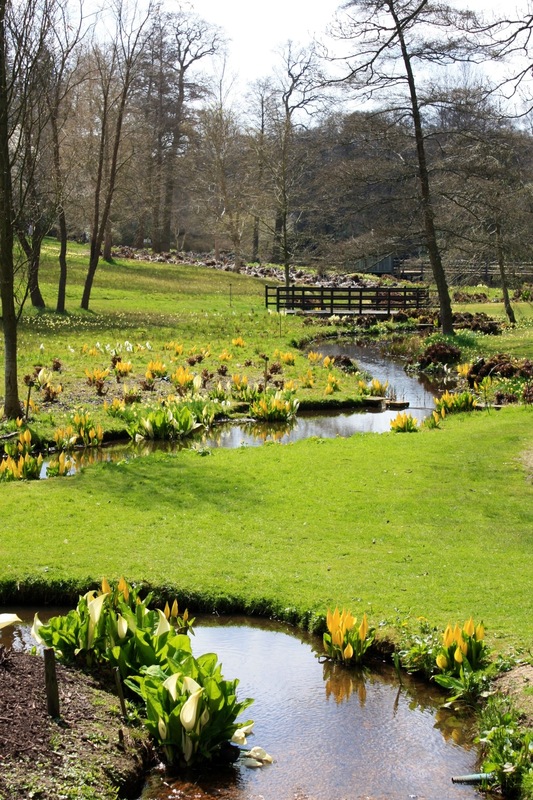 Here at the Savill gardens Lysichiton light up the boggy meadows and streamsides like the footlights on a grand stage. In the alpine meadow on the south-west side of the garden, the moist, open grassland is peppered with species daffodils and snake’s head fritillaries. The most prominent daffs are the native lent lily (Narcissus pseudonarcissus), the hoop petticoat daffodil (Narcissus bulbocodium) and the narrow, swept-back cyclamen flowered daffodil, Narcissus cyclamineus. The effect is completely natural but actually began from just a handful of seeds strewn across the meadow. 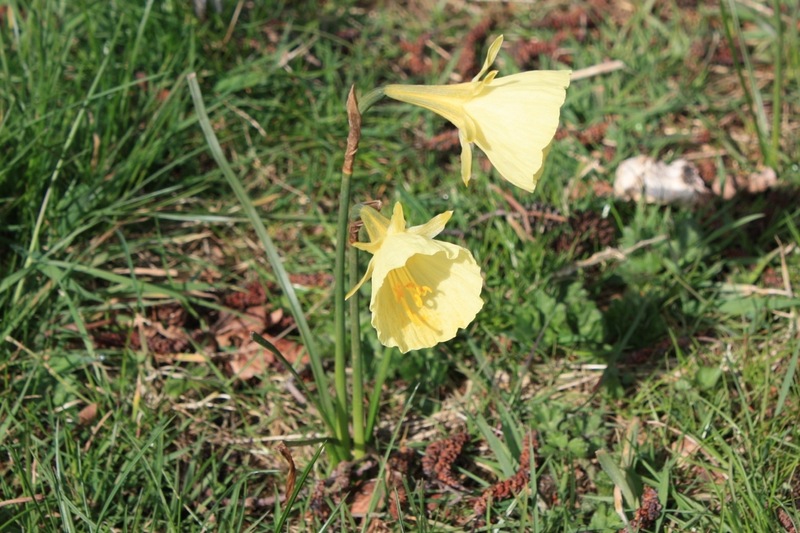 Narcissus bulbocodium in the alpine meadow. 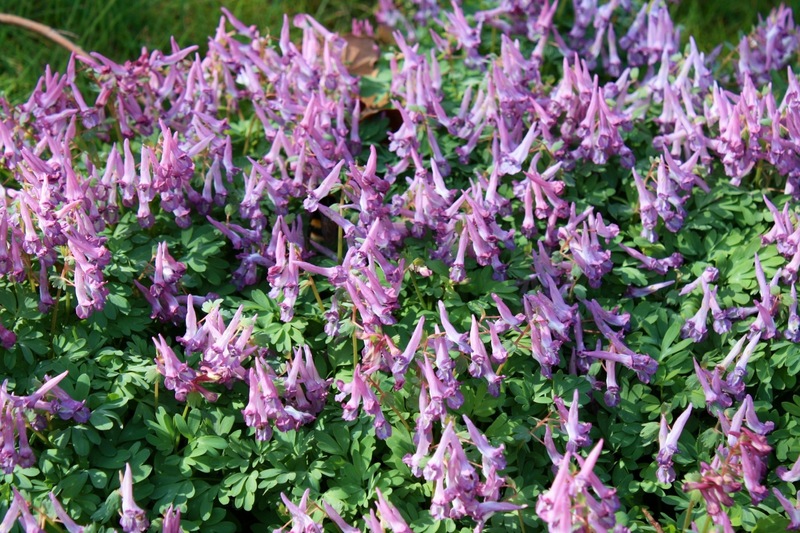 At this time of the year it pays to keep your eyes to the ground, and close to The Savill Building large clumps of pink Corydalis solida lit up the sward. Corydalis solida growing in meadow grass. Arguably my favourite part of the garden was the secluded Hidden Gardens, where the rich peat beds were already bursting forth with choice bulbs and perennials. 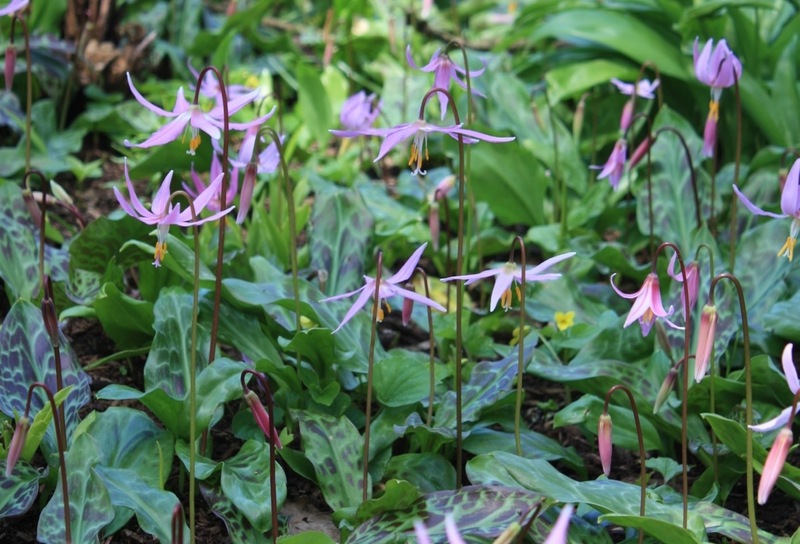 Lighting up the shade were thousands of star-like Erythronium revolutum, the beautiful mahogany fawn lily. 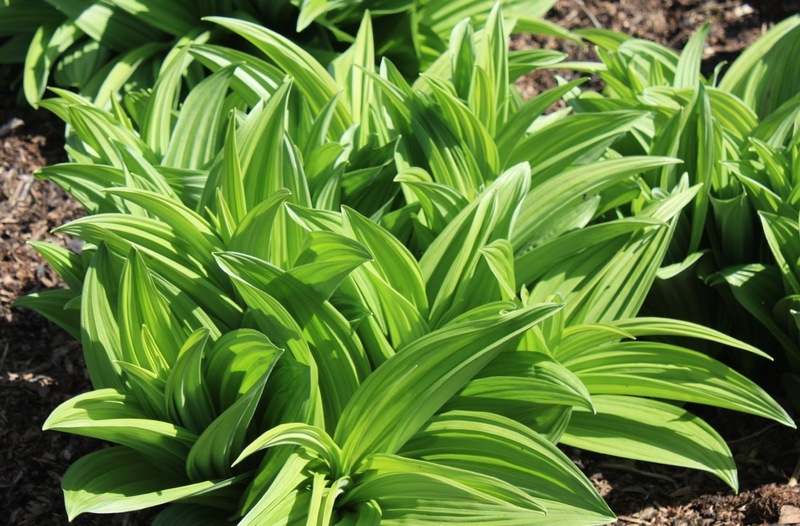 The speckled foliage is a bonus, but no match for one of my favourite foliage plants, Veratrum album, the false helleborine, which has amazing, corrugated bright green leaves followed by white flowers in summer. But beware, the root is very poisonous, with a paralyzing effect on the nervous system. Even sniffing the flowers can cause nasty health problems. A plant best admired from afar! Erythronium revolutum in the Hidden Gardens. The corrugated leaves of Veratrum album. Finally, no spring garden is complete without primulas. 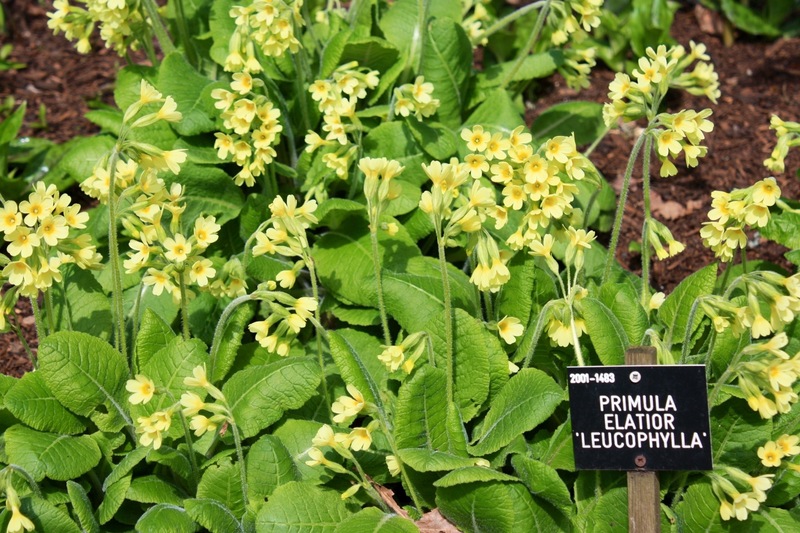 The Savill Garden provides the ideal environment for many moisture loving species, including Primula prolifera, P. beesiana, and P. japonica. However I was particularly taken with the yellow, cowslip-like flowers of P. elatior ‘Leucophylla’, a subspecies of the native oxlip. 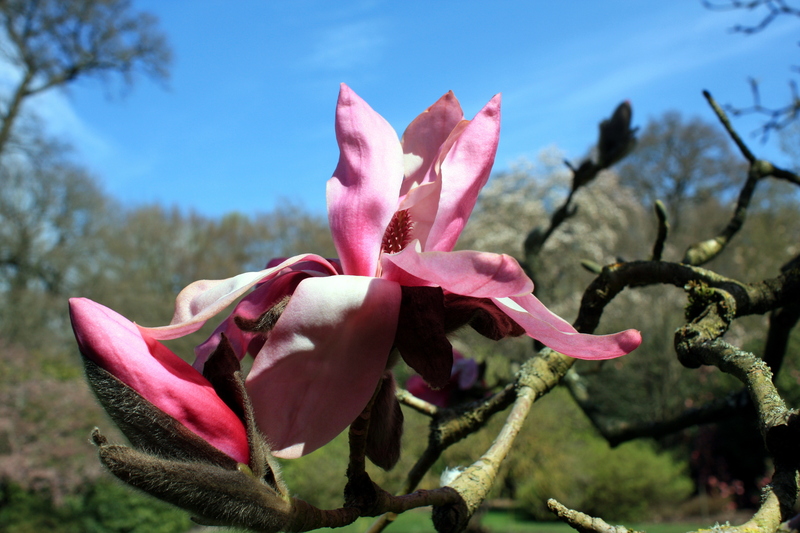 At any time off year, The Savill Garden is well worth a visit, but especially during spring when the magnolias, rhododendrons and camellias are in their prime. Despite all the modern facilities, shops and eateries, when you get out into the garden itself it’s easy to get lost in the plants and birdsong, forgetting you’re just a few miles away from Heathrow. 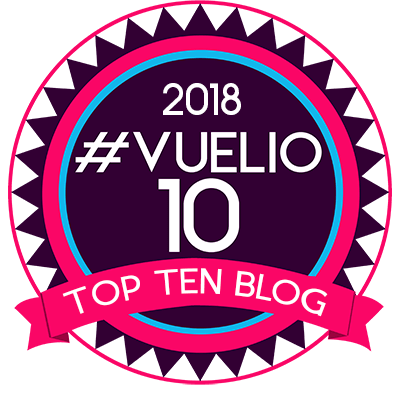 Tagged with: azaleas Corydalis daffodils Eric Savill Erythronium FEATURED Lysichiton magnolias primulas Rhododendrons Savill Garden Veratrum Windsor Great Park. Wonderful tour of a gorgeous garden. Thank you, and I just love the shot of the stream – it is a beauty. I know, it’s such a beautiful time of year, and so fleeting. I’d love a garden with a stream, although there were springs everywhere which is probably a nightmare for drainage and lots of other plants. We always want what we can’t have!